Dandy is an 18-month old Standard Poodle. Last month X-rays revealed minor hip dysplasia in her left hind. The revelation was bitter-sweet for foster parent Liz Toop. 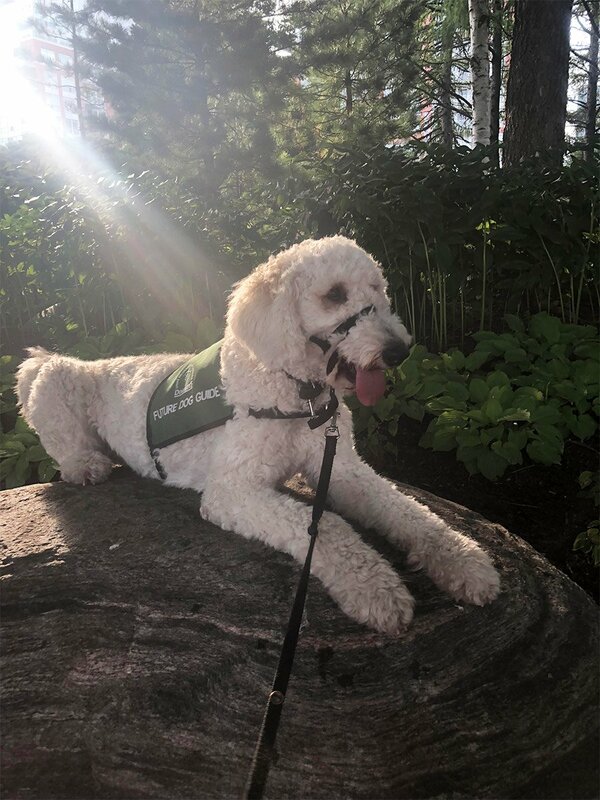 Dandy was a part of the Lions Foundation of Canada Dog Guides program in Oakville, Ontario and was scheduled to begin training for her new life as a service dog. This dysplasia in her hip meant that she was no longer a candidate to begin training. The news came as a surprise to Liz, who couldn’t help but feel saddened that the dog she had grown to love had a condition that would require lifelong management. The prospect of seeing an animal you love in pain is heartbreaking. However, with this, she also had the opportunity to adopt Dandy as a pet and a lifelong friend. She jumped at the opportunity and although Dandy’s life path had taken a turn, she will now enjoy the rest of her life in the loving home of her new pet mom. The Lions Foundation of Canada Dog Guides program started in the early 1980s with a focus on serving Canadians with visual impairments. It has since evolved and grown to include Hearing, Service, Seizure Response, Autism Assistance, Diabetic Alert and newly introduced, Support Dog Guides. To do this, the Foundation operates Dog Guides Canada, a preeminent national training school and charity that assists individuals with disabilities through specialized Dog Guide programs. Sometimes, health factors disqualify candidate dogs from continuing in the program. Hip Dysplasia is one of those conditions. This condition occurs when the joints don’t set properly during the development. Sometimes there are genetic factors and certain breeds may be more predisposed to developing the condition. Standard Poodles are certainly not among the most likely breeds to develop this condition, however it’s estimated that 12% of all Standard Poodles have a dysplastic condition. While it is news no pet owner wants to hear, many dogs can enjoy a long, happy, healthy and pain-free life with the right combination of a healthy diet, a quality joint supplement, weight management, and the right kind of exercise. Liz now uses TRI-ACTA to supplement Dandy’s diet and provide the support she needs. The product is designed to repair cartilage, prevent breakdown and reduce inflammation. There is also an option that has a highly therapeutic form of Hyaluronic Acid to increase the supply and viscosity of the joint fluid. The product is pure and concentrated and does not contain any fillers. This means the servings are small and the product is extremely easy to administer. While she likely doesn’t realize it, Dandy’s unfortunate circumstance has landed her in a family that loves her. She may not have had the opportunity to be a service dog, but she will continue to enhance the lives of those in her new permanent family.